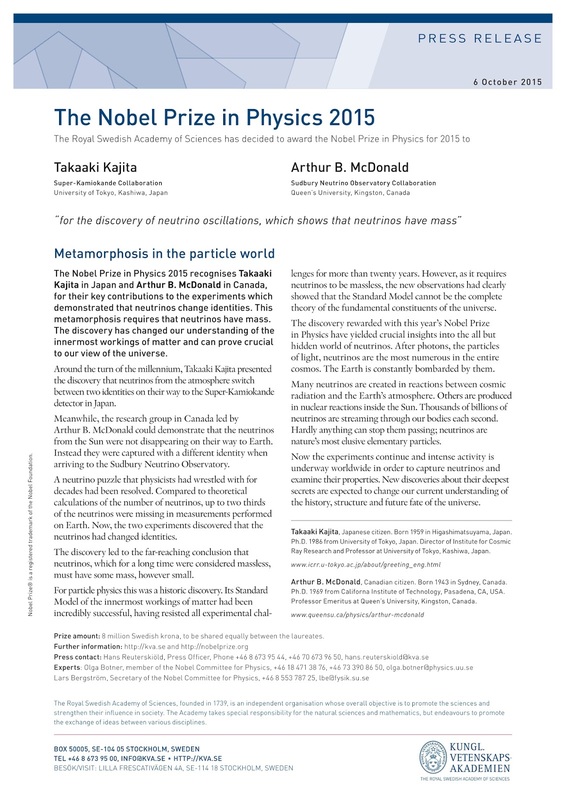 The Nobel prize in physics has been awarded to Takaaki Kajita and Arthur McDonald for discovering that elusive subatomic particles called neutrinos weigh something more than nothing. Named after the Italian for “little neutral one”, neutrinos have no electric charge and were long thought to have zero mass, but Kajita at the University of Tokyo and McDonald at Queen’s University in Kingston, Canada, showed otherwise. With two separate detectors built deep underground, one a kilometre beneath a mountain in Gifu prefecture, and the other 2km down an old nickel mine in Ontario, the scientists discovered that neutrinos can flip from one form to another as they hurtle through space – a chameleon-like behaviour that proves they have mass. The Nobel committee said the discovery had “changed our understanding of the innermost workings of matter and can prove crucial to our view of the universe”. Neutrinos are among the most abundant particles in the universe and thousands of billions of them pass through each of us every second of the day without us noticing. Many were forged in the big bang, but others are created constantly through radioactive decay inside the Earth, by exploding stars, and in nuclear processes that power the sun. 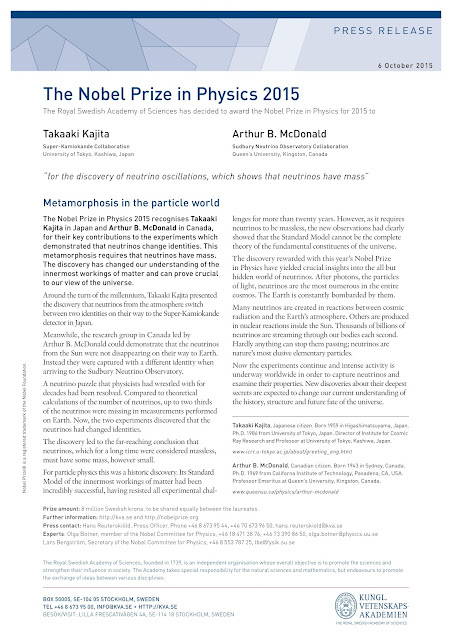 Kajita and McDonald’s work solved a puzzling observation that, compared with theoretical calculations of the number of neutrinos expected to be bombarding the Earth from the sun, up to two-thirds were apparently not arriving.Their existence was first postulated in 1930, but it was not until 1956 that two American physicists found traces of the particles, which come in three flavours, known as tau, electron and muon neutrinos. In 1998, Kajita’s team discovered that neutrinos created when cosmic rays slam into the Earth’s atmosphere changed flavours on their way to the Super-Kamiokande detector under Mount Kamioka in Japan. Then, on the other side of the world in 2001, McDonald’s team saw that neutrinos from the sun, detected by the Sudbury Neutrino Observatory in Canada, also switched identities. The finding implied that neutrinos must have mass, a discovery that meant the so-called standard model of physics could not be complete in its explanation of the fundamental building blocks of the universe. Scientists now know that the neutrino mass is more than a million times less than that of the electron. But because the particles are so abundant, the combined weight of neutrinos is estimated to be roughly equal to the combined weight of all the visible stars in the universe. In the process of analysing neutrinos coming from the sun, McDonald’s team were able to verify processes going on in its core. That work could have practical applications in developing nuclear fusion. Prof Jon Butterworth, head of the physics and astronomy department at University College London, said the work had “solved the longstanding solar neutrino problem, which was one of the things we were taught as students as being a weird anomaly which wasn’t understood – not enough neutrinos coming from the sun. Previous winners of the physics prize have included Albert Einstein, Niels Bohr, Werner Heisenberg and Paul Dirac. Only two women have ever won the Nobel physics prize. Marie Curie won in 1903 (with her husband Pierre, and Antoine Becquerel) for her work on radiation. The last woman to win was Maria Goeppert Mayer who won the prize in 1963 (along with J Hans D Jensen and Eugene Wigner) for her work on nuclear shell structure.“The discovery opened up a whole field of neutrino physics which is still producing amazing science,” he added. The Nobel in medicine or physiology was awarded on Monday to Tu Youyou, William Campbell and Satoshi Ōmura for advances that led to treatments for parasite-caused diseases including malaria. The winners of the chemistry, literature and peace prizes are to be announced this week. The economics prize will be announced on Monday 12 October.